I recently sat in a beat-up rowboat on the River Ganges, watching the layers of contrasting and connected lives on the shores of Varanasi, thinking of Achilles’ Shield. (Yes, I use Homeric poetry to process intense experiences in my life). While Varanasi is not engulfed in war, it is as close to a real-life reproduction of the complete human experience that Achilles carries on his arm to meet Hector. In Book 18 of The Iliad, the god Hephaestus forges Achilles a new shield before his fate-changing return to battle against the Trojans. Hephaestus creates a shield worthy of the epic, as it contains the human world and all the contradictions that come with it. Hephaestus captures human nature within the confines of a circle of bronze and leather. Homer uses 130 lines of poetry and the fortunes and destitution of two contrasted cities to show us the ebbs and flows of humanity. 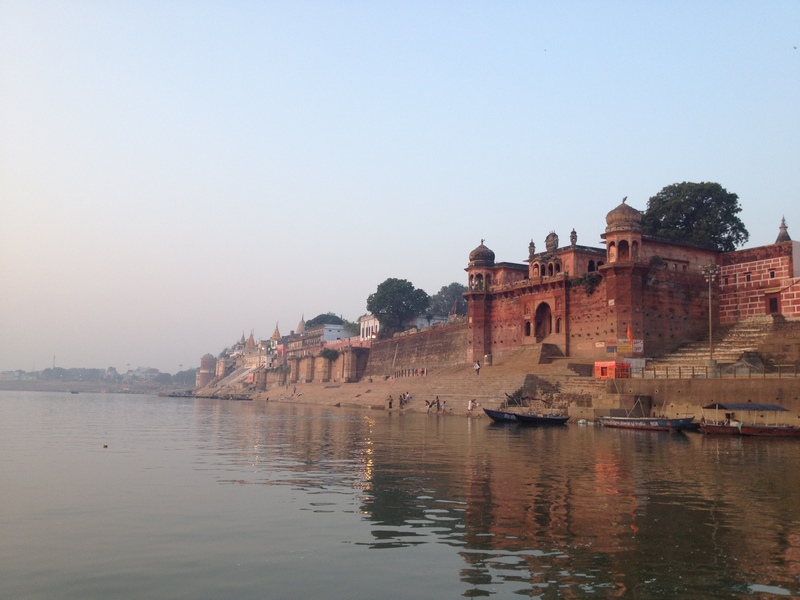 Varanasi is a small city with an epic history. It was once one of the greatest cities in the ancient world. Visitors had to arrive by boat, and the 9 miles of city walls with nearly two dozen dramatic gates introduced a grandeur that it still emits in special moments. An ancient foreign emissary to Varanasi once wrote that this city surpassed all the great cities he’d seen – Athens, Sousa, Rome, Jerusalem. Time did not treat this once great city favorably. It was destroyed several times by foreign invaders so that much of what exists today is not more than a few hundred years old. I found it to feel like a relatively small town with a big challenge: this city is one of the holiest places in the world. 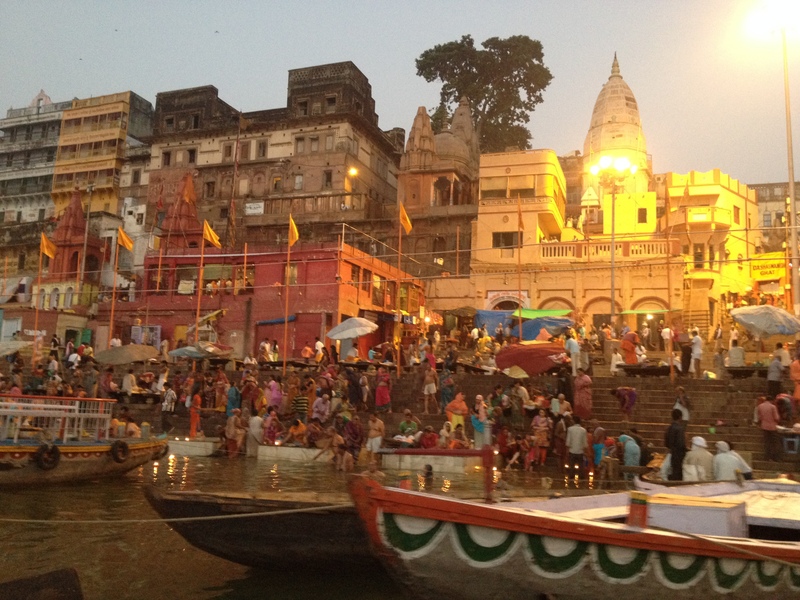 For Hindus, Varanasi is perhaps the most sacred place, and so, millions pilgrimage here each year. Bathing in this river during one’s life, or being cremated here after is believed to help achieve moksha, release from the painful cycle of human reincarnation. Untold numbers of non-Hindus, like me, come to see what the spectacle is all about. Early mornings bring most pilgrims to the shoreline, and evening offers ritual ceremonies with bells and fire. As a result, dawn and dusk are prime time for boat tour hours. From my boat, I began to see the great divide that occurs in and around this holy water. The poorest of the poor bathe at the steps in front of the great temples, which are called ghats. These ritualized bathing spots are believed to offer the best chance at achieving moksha. Believers are lined up elbow-to-elbow, and in rows three deep to get in the water. Men in their lungees and women in their bathing saris of varying vibrant colors dunk, splash, and scrub themselves. The bathing movements appear so similar to be routines, but they are done in different speeds, so while out of sync with each other there’s a near-synchronicity to the human actions on the river’s edge. Squeezed in between the bathers is the high-pitched chanting of pilgrims and the heavy brass tones of ringing temple bells. In the end, all the space is filled with movement and the senses are overtaxed with the beautiful chaos. The worshippers appear to the viewers from the boats against a back drop of the ghats and the walled palaces that belong to the families of the great maharajas of old India. India has only been a single political body for six decades; before that it was a vast land of fiercely competitive kingdoms. The maharajas, or great kings, from across the subcontinent built testaments to their own importance along the shore long ago. Great walls of these mansions jut up vertically from the water line. The walls add to the dramatic flair of the structures, and they serve a critical function. Each monsoon raises the level of the river by about 40 feet or more. The abrupt walls literally keep water out of the palaces, thus keeping a clear distinction between land and water. But there’s another clear divide, too: the walls, with turrets atop and viewing plazas in between also delineate the stark contrast between lives of those at the foot of the walls and those who sit atop them. Perhaps the difference is only 50 feet, but the distance may as well be worlds apart, for the people in each location could never imagine existing in the others’. The caste system is as vibrantly alive in Varanasi as the color variations and patterns of the elaborate saris for sale in the textile shops. As news of the rituals on display on the river bank spread outside of this region, travelers curious about Hindu rites or India in general, have come here in droves, adding a new caste to the ancient social layers. The short term visitors only stay a few days at a time, but rooms in the guest houses are never empty, and our (for I am clearly one of this horde) omnipresent existence is the source of wealth for a caste of denizens in this town that otherwise would have no options for financial gain. 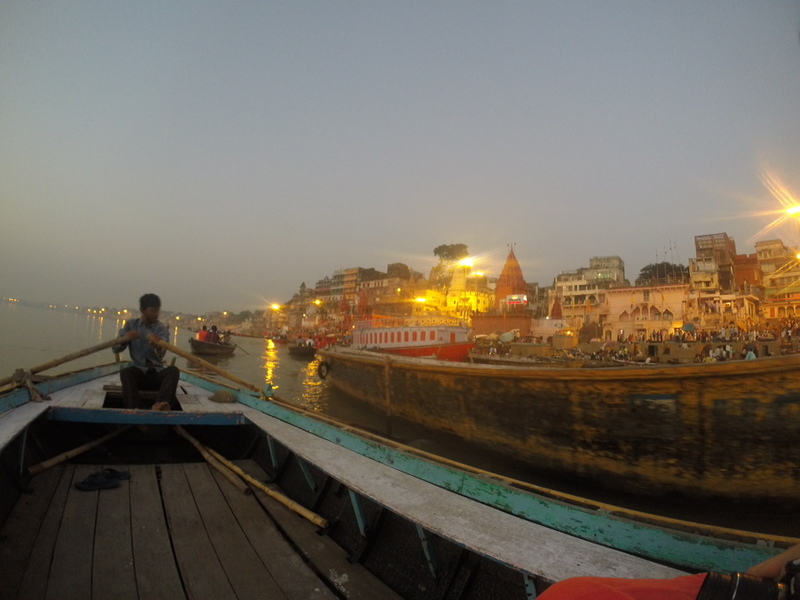 I interacted with dozens of people in my four days in Varanasi who called the city home. Every single one wanted me to buy something, rent something, or make a donation to some worthy cause. Each person was just one making a request like a single musical note, but taken together, each day was a movement by a full orchestra. My favorite experience was around one of the Burning Ghats, which is where bodies are cremated on funeral pyres that burn for around three hours each. It is possible to walk right up to these ghats, as long as you’re not pointing your camera anywhere near them. In fact, upon arriving there (each time, for we walked past the ghat several times) we were told repeatedly “No photos!” That makes sense to me – I can see how the family of the deceased would want to preserve some privacy. At the same time – and I mean the exact same time – we were asked to donate to the hospice (that doesn’t exist) so many times that by day two I could predict the order of the sales pitch. And in the background, a goat is eating the remnants of a funeral shroud, the water buffaloes are pooping really close to one of the smoldering pyres, and there’s a generator running a water pump to power a water hose for spraying the caked mud off the walk-way that is adjacent to the pyre area. It’s hard not to be mesmerized by the spectacle of these abrupt contrasts. It’s easy to forget that we are watching people in their most intimate moments. Much of my India is like this – on my morning walk I can see fishermen in the village a mile south of where I live defecating in the morning tide if I want to, and on the same walk I pass a movie-star’s housing compound – but in Varanasi there are no margins. I see people sleeping, begging, pooping & peeing, crying, laughing, hustling, and mourning their deceased loved ones as the funeral pyres burn brightly. And all within a few feet of each other. The power of Achilles’ Shield is that it contains the fullness of the human experience within the two cities captured together in bronze and leather. Here, too, is the full range of humanity. The sacred and the ordinary, all smashed together.